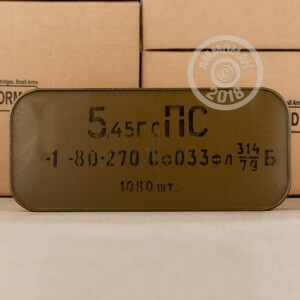 This 5.45x39 ammo is Russian military production with 53 grain full metal jacket bullets and will work great in any AK-74 pattern rifle. The bullet boasts a flatter trajectory and lighter weight than its 7.62x39 cousin and was adopted for many of the same reasons that NATO militaries adopted the 5.56x45 round. 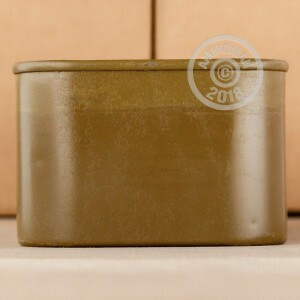 Each sealed metal canister contains 1,080 rounds in Berdan primed steel casings. This ammo is known for its reliable ignition and unbeatable price. Note that this ammunition uses corrosive primers. However, its corrosive properties will not affect your firearm if you perform a good cleaning after every range trip. These rounds also have magnetic properties due to the steel used in their construction, so check with your range operator before using them indoors. These rounds are packaged in a sealed can, which may not include a can opener. As with all orders from AmmoMan.com over $99, this can ships for free!